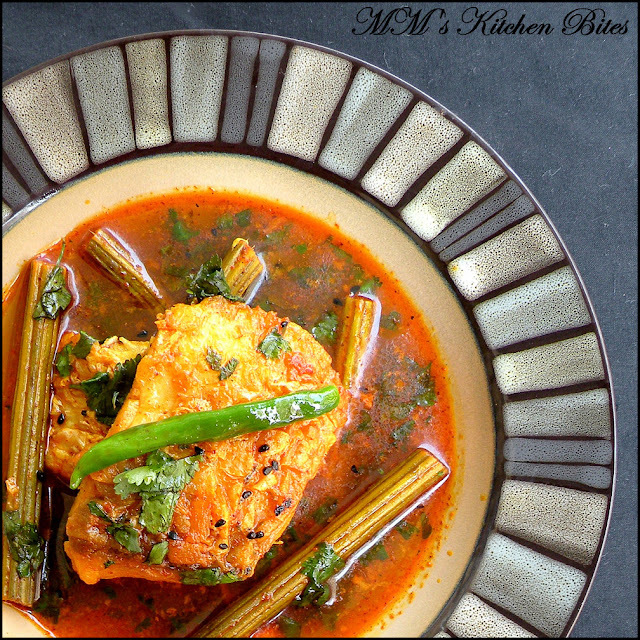 MM's Kitchen Bites: Rui Macher Tel Jhol/Fish flavored with nigella seeds and green chilies and cooked in mustard oil...the joy of mustard oil!! Rui Macher Tel Jhol/Fish flavored with nigella seeds and green chilies and cooked in mustard oil...the joy of mustard oil!! Wash the fish in cold running water. Drain and pat dry. Lay the fish in single layer on a tray/plate and sprinkle salt and turmeric on it. Rub in the salt and turmeric on both sides of the fillets and keep aside for 10-15 minutes to marinate. Heat 1 tbsp mustard oil in a pan on medium heat. 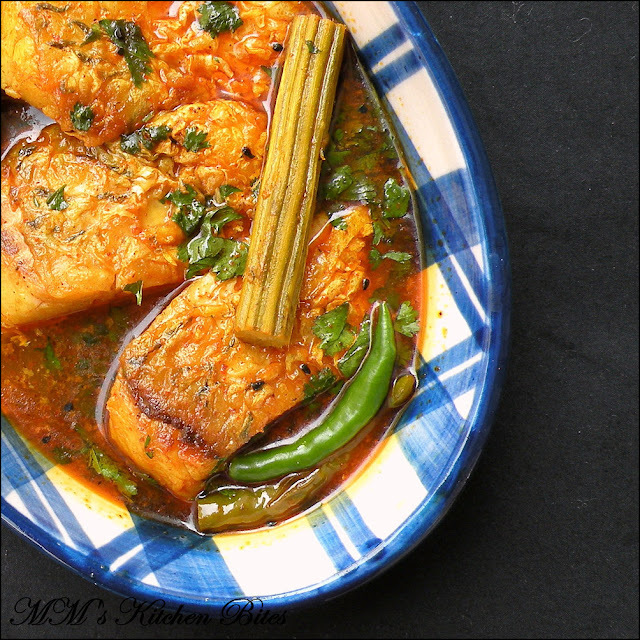 When the oil is sizzling hot, slide in the fish and fry till light golden brown on both sides. Remember the oil needs to be sizzling hot and to turn the fish only once or else the fish will break. Also, don’t fry the fish for too long or till deep/dark golden brown as it will get tough and chewy – need it to be just crispy on the outside and soft on the inside. Drain the fish well with a slotted spoon and keep aside. In the same pan, add 2-3 tbsp more of the mustard oil. Lower the heat and add nigella seeds and the green chilies. When they sizzle, add in the turmeric and red chili powder. Stir for 4-5 seconds (don’t let the spices burn). Add back the drumsticks/potatoes, if using. Cover and let them cook for 5-7 minutes, till the veggies are half done. Increase the heat and add in the water. Once it comes to a boil and lower the heat and slide in the fish and eggplant. Cover and let it simmer for 8-10 minutes. Take off the heat; add in whole green chilies, coriander leaves and lemon juice. Serve hot with plain steamed rice. Mix in Ginger paste, 1 tsp, Cumin powder, ½ tsp and turmeric powder, ½ tsp (and ½ to 1 tsp Kashmiri red chili powder if you want for the colour) with couple of tablespoons of water. Add in after nigella seeds. Stir for 10-15 seconds and then proceed as above by adding veggies.